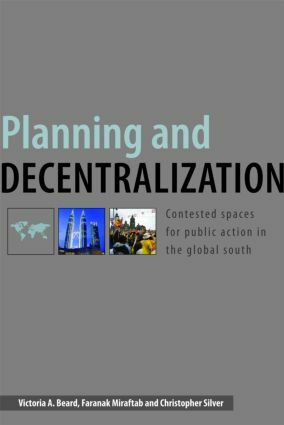 The first in-depth study of the impact of economic and political decentralization on planning practice in developing economies, this innovative volume, using original case study research by leading experts drawn from diverse fields of inquiry, from planning to urban studies, geography and economics, explores the dramatic transformation that decentralization implies in responsibilities of the local planning and governance structures. Offering unique insights into how planning has changed in specific countries, paying particular attention to South East Asian economies, India and South Africa, this excellent volume is an invaluable resource for researchers, graduate students and planners interested in urban planning in its international political and economic context. Victoria A. Beard is an Associate Professor of Urban Planning at the University of California at Irvine. Her research and teaching focus on international development planning, community-based planning, collective action, social movements and poverty alleviation. Faranak Miraftab is an Associate Professor of Urban and Regional Planning at the University of Illinois, Urbana-Champaign. Her research and teaching are concerned with transnational processes of community development, with special focus on grassroots strategies and mobilizations for access to housing and basic services. Christopher Silver, FAICP, is Dean and Professor of the College of Design, Construction and Planning at the University of Florida. He has taught and consulted on urban development and planning in Indonesia over the past eighteen years. He is author of Planning the Megacity: Jakarta in the Twentieth Century (Routledge).